Rock Painting – A Beginner’s Guide will help you navigate the art of spreading kindness in the world. Starting something new can be overwhelming, but help is on the way. Something as simple as painting rocks can be daunting when there’s so much information out there. We’re going to give you step-by-step instructions on how to get started and pretty soon you’ll be a pro. Make sure you join our Facebook group Rock Painting Ideas and Resources. 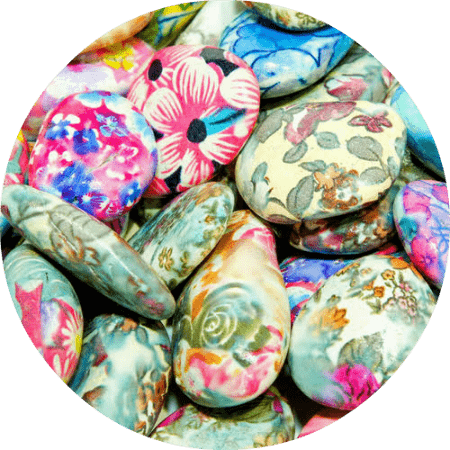 It has over 21,000 rock painting enthusiasts just like you sharing ideas on what to paint and the best ideas out there. It offers daily inspiration, tips, and techniques. Plus, you wouldn’t want to miss out on all the fun! You can join this group here. If you’re not blessed to have smooth river rocks in your area, you’re not alone. You want smooth stones because you’re going to want to have an even coat of paint. There are different areas around the world where they are just not plentiful or that it’s illegal to remove rocks. Some of the places to find rocks are landscaping companies, rock companies, craft stores, home improvement stores and online here on Amazon. If you buy rocks that look shiny, please know they’re probably coated in wax that you have to boil off because paint doesn’t stick to a slick surface. RELATED POST: I wrote an entire post devoted to this topic, you can find it here. 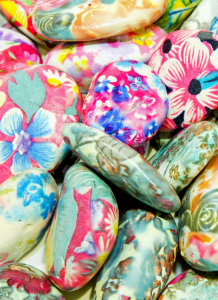 You’re going to want to clean your rocks because you don’t want to paint on dirt. A clean surface allows the paint to adhere better and provide a smooth base without any bumps or debris getting in your paint. A) Buy a small plastic tub and use this to clean your rocks. B) Use dish soap and hot water to clean off the dirt. Don’t soak them, because water will seep into the rocks and they will take longer to dry. C) Use a dish scrub brush to get it really clean. D) Rise with clean water. Use sandpaper to smooth out and bumps or edges, you can sand using 150 grit sandpaper that you can find here. To keep your table clean and prevent paint spills on your furniture, you can purchase vinyl to place on your station. You can find it here. Paint or spray primer on the rocks. Primer allows the colors to pop and you’ll use fewer coats of paint. It also allows paint to adhere better to the surface and a primer with gesso will help make the paint smooth. You can find gesso primer paint here. I use acrylic patio paint for most of the rocks I paint. You can find a complete set here on Amazon with a variety of colors. Paint your base coat of paint on the rock. Depending on the color, it will take one to two coats. Have a pencil with an eraser handy so you can draw out the design on your base-coated rock. Creating an outline makes painting the pattern so much easier. You can also just add the top applicator to your paint bottles with these Fineline caps. How many have us had been guilty of not cleaning our brushes right away and throwing out a rarely used brush because of it? Soak your paintbrushes in this, and you’ll never have to do that again. Keep a container of baby wipes handy for mistakes. Cotton swabs are perfect for removing unwanted paint in an area. Dotting tools makes perfectly round dots for mandalas. They’re really inexpensive and can be found here. If you’re looking to add details or use markers on your rocks, I use Posca pens. Most rock painters love them. Each set has a differently sized tip-point, so make sure you pick the right one. I prefer the fine and ultrafine pens. You can find them here. Micron pens are also great for detail. To avoid clogs in the pens, make sure you scribble on paper often. You can find Micron pens here. Make sure you give your rocks time to dry. I usually paint my rocks and then let them dry overnight. You can also use a hair dryer to speed the process up. Make sure you don’t put your stones outside without adding a seal to the rock. If you don’t, your hard work will smear with the elements. If you use Mod Podge, it will curdle if left outside. Two thin coats of sealant work best. You should pick an outdoor weather resistant sealer. My favorite spray sealant is here. Here’s another sealant that works well: Rust-Oleum Gloss Clear. Make sure if you use a spray sealant to do it in a well-ventilated area. I use wax paper to spray the rocks on so they don’t stick to paper or cardboard. Now here comes the fun part, it’s time to hid your rocks. You can use an egg carton to transport rocks to hide to prevent from rubbing together and scratching. DO NOT HIDE ROCKS: On anyone’s personal property, in businesses (unless you ask), state or national parks, or where a mower can run over them. It’s okay to mess-up. Start easy with bees, butterflies, hearts or flowers. 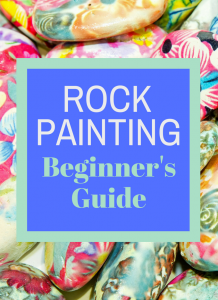 I hope you enjoyed Rock Painting – A Beginner’s Guide. Let me know in the comments below what your favorite tips are. You can follow me on Pinterest here, where I pin the latest and best rock painting designs. Don’t forget to join our Facebook group here, and show us your works of art.